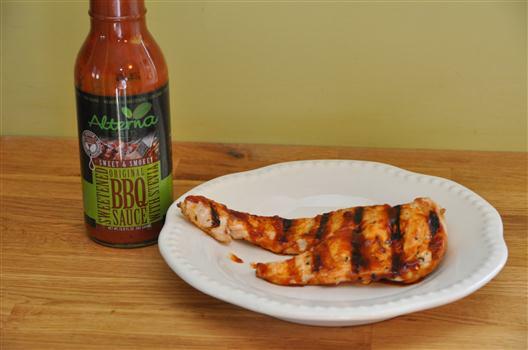 This Washington state based sauce has something different in it and it’s not afraid to tell you about it. It steers clear of traditional sweeteners (sugar, molasses) or bad rep sweeteners (such as high fructose corn syrup) and focuses on the use of the plant extracted sweetener Stevia. Studies show Stevia isn’t bad for you and can actually be good for you… “Millions of Japanese have been using stevia for over thirty years with no reported or known harmful effects. Also a 2009 review study found that stevioside and related compounds have anti-hyperglycemic, anti-hypertensive, anti-inflammatory, anti-tumor, anti-diarrheal, diuretic, and immunomodulatory [no clue what that means] actions”… more here. Let’s have a look and a taste. At a higher level, I’m not sure the goal of the sauce is on the money. Why use Stevia in this case? Why not use sugar or molasses? The answer is here (it has a negligible effect on blood glucose which is great for people on carb controlled diets). The carbs count is 9gb of sugar (but its actually 6g per serving because of the 3g sugar alcohol you deduct from total carb, according to AlterSweets Founder Jared McGuire). 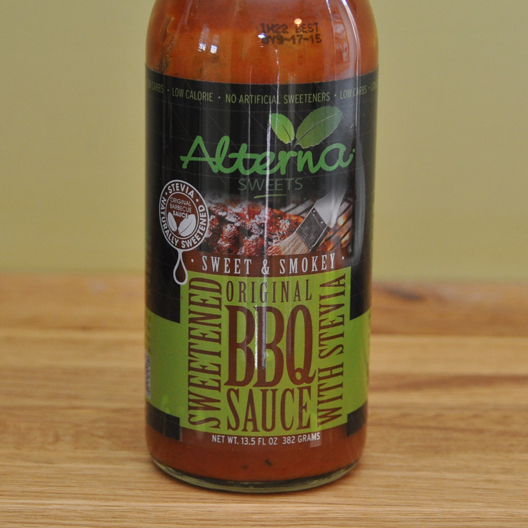 And sure, I get that and I know lots of people who prefer artificial sweeteners, but I’m not sure many folks seeking BBQ sauces are going to be looking for Stevia on the label. In my sauce I like a natural flavor with real, authentic ingredients. And although Stevia is a natural plant-based extract – it feels like the just the mention of the word stevia almost makes it taste different. In summary, I would recommend this to you if you are on a strict low carb diet – there’s not a lot out there and you may be pleasantly surprised with it. For others, regulating the sugar content of the sauce that you put on a piece of meat might not be the most effective way to meet your health goals.